It's Friday, and I can almost taste Bahama Breeze's yummy rum and coconut cocktails. I am already a huge fan of the food and drinks at Bahama Breeze. So, when the restaurant chain introduced a line of "Legendary Island Cocktails" for the summer, I was thrilled. They all sound so good, and all are tied to stories surrounding the Bahamas, Barbados, Cuba, and other islands. For example, the new Painkiller - a mix of Cream of Coconut, Pusser's dark rum, pineapple, orange and nutmeg - was invented at the Soggy Dollar Bar on the island of Jost Van Dyke in the British Virgin Islands. The Dark 'N Stormy - known as Bermuda's national drink - features Gosling's Black Seal Rum and ginger beer. 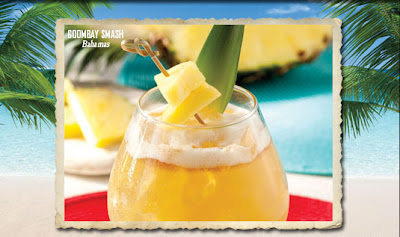 Another new offering from Bahama Breeze - the Goombay Smash - is actually known as the Bahamian national drink. It is made with Captain Morgan, Meyer's Dark Rum, orange juice and pineapple juice. I would also recommend trying other new creations, including Barbados Rum Punch, Batida de Coco (Brazil's version of the Pina Colado made with Leblon Cachacha Rum, Cream of Coconut and pineapple juice), the Havana Hotel Special, and Parrot Passion. I would also highly recommend a drink that has been on Bahama Breeze's menu for awhile: The White Satin. I am so happy I tried it last time I was there - it is my new favorite! It's a smooth, delicious mix of Parrot Bay Coconut Rum, Cointreau, coconut milk and ginger. It is very light for the summer and is a perfect "girly" drink. As far as food, you can't go wrong with any seafood appetizer or entree at Bahama Breeze. I love the Coconut Shrimp, Fish Tacos, and surprisingly - the Seafood Paella. 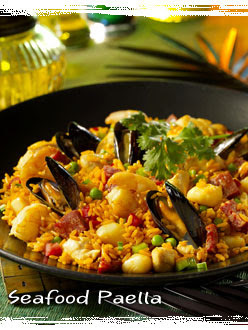 I am surprised the flavors are so good, since paella typically takes hours to prepare correctly. This one tastes like it was done right and is generous with its seafood, chicken, and sausage. Bahama Breeze also does a great job with non-seafood entrees, including its Wood-Grilled Burger, its Jerk Chicken Pasta, and the new Tropical Curry with chicken. To top it all off, Bahama Breeze's staff go out of their way to help people with food allergies have a great experience. Have you tried the new Legendary Island drinks or some of the new appetizers and dinners on the menu? If so, let me know how you liked them! What is a Cluster Funk?